She loves him, and he loves her back. Alas, one is way too shy; the other just cannot muster up the courage to profess his love. Will this love remain forever unfulfilled as both sides hesitate to make the first move? 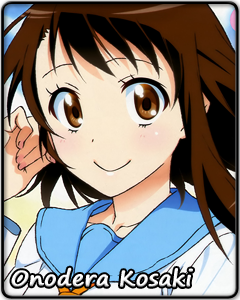 Meet Onodera Kosaki, the popular and kindhearted girl that every guy dreams about. Her weapons? The kindness she protrudes, the almighty smile, and the shyness that is all too cute. But, whatever the boys around her might think, Kosaki spends her days just like any teenage girl – hanging out with her friends, doing girly things, and just acting as herself. If there is something unusual about her life, it is the fact that her crush just happens to be the son of the neighborhood yakuza. But he isn't scary, Kosaki thinks to herself as she reminisces about the kind smile she has known since childhood. While she might not be the only one after the lad’s heart, she still manages to make friends with her competitors. That is just how she is – open-hearted to everyone around her, to her friends, and even to her rivals. However, that does not mean she is going to hold back in the battle for love. So, meet Onodera Kosaki, not as a 17-year-old girl living out her school life, but rather as a girl struggling to say three simple words: “I L-O-V-E Y-O-U”.